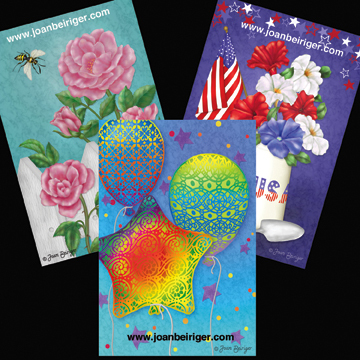 Sending postcards to manufacturers or distributing them at trade shows is a good way to market art. Many artists use the standard 4 by 6 inch size cards and some use a larger size to better showcase their art. There are all sorts of printing options such as either a glossy or matte finish, printed on one or two sides, square or rounded edges and unique shapes of the cards. The cards can also be printed on recycled paper and with eco- friendly soy based inks. Of course, many of these options drive up the cost of the standard rectangular 4 by 6 inch, printed on one side, glossy card. But it may be worth the extra cost if you wish to make a statement such as using eco-friendly materials or a different shape card to stand out from the crowd. There is no one way to place art on a postcard. It depends on how the postcard is being used. Some artists place their website or contact information on top of a single image on each side of the postcard to distribute to manufacturers while others show a series of images on one side of the postcard and put contact information on the other side while leaving space for a stamp and mailing address. 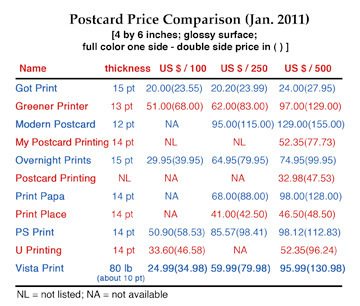 Below is a list of some companies that print postcards. Some of the companies gives the option in using recycled paper, has periodic discounts, prints other products such as business cards and trade show vinyl banners, and offers other services such as direct mailing from your mailing list. The companies marked with a * have been recommended by artists responding to a postcard discussion on Linkedin Art of Licensing group. 4 Over, Inc. - wholesale distributor of print media (need to log-in to view prices) Recommended by artist Aileen Homes (see comment section of this article). Below is a price comparison of the companies listed above for a 4 by 6 inch glossy surface, full color one and two sided postcard. Notice that also listed is the thickness of the card stock and in one case the weight of the card stock. Card stock thickness in the US is measured in points (pt). A 12 pt card is 0.012 inch and a 14 pt card is 0.014 inch. So the larger the pt number the thicker the card stock and the more durable it is for handling and sending through the mail. Note: Other countries describe card stock in grams per square meter (135 to 300 grams per square meter; or 50 lb to 110 lb). There is no absolute conversion from pounds to pts because the density of the paper may vary. However, 80 lbs is approximately 10 pt. Comments and suggestions are welcomed. Please click on comments and write them in the comment window at the bottom of this article.